Sometimes they call themselves chapulines. It's a Oaxacan inside joke. Chapulines are small insects, like grasshoppers. When they're toasted with lime and garlic, they're a delicacy that's as much a part of Oaxacan indigenous culture as mezcal or big tlayuda tortillas. One worker standing in line in the edge of a San Joaquin Valley blueberry field laughed at the name. "We're very humble, like chapulines, and there are a lot of us, like we're all piled up together on a plate." Another reason he liked the similarity was the color: a plate of chapulines is reddish brown. Pointing down the line of workers, he gestured: "Look at all the t-shirts." Hundreds of workers had lined up in two long rows in the pre-dawn darkness, ready to vote in a union election last Saturday morning. 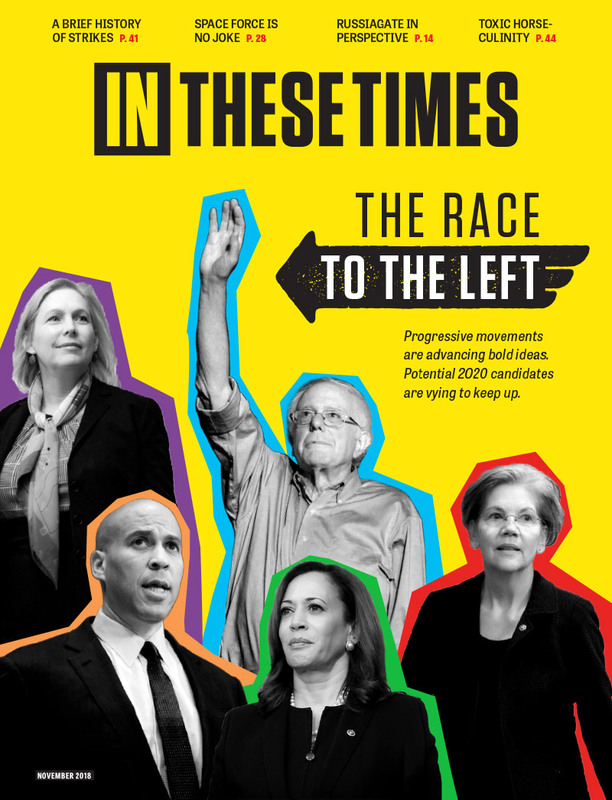 So many were wearing red t-shirts emblazoned with the black eagle of the United Farm Workers that the few people without them stood out conspicuously. As the sun came up, the lines slowly moved toward the ballot boxes, and workers began to vote. By 11:00 a.m., it was over. Blueberry pickers in their red t-shirts poured out of the rows of bushes, and then gathered in a semicircle to watch an agent of the Agricultural Labor Relations Board make the count. As he announced it, 347 to 68 in favor of the union, the cheering started. The chapulines had won. Workers may make jokes about their indigenous identity, but a far less pleasant reality led to their decision to organize a union. "The majority of the people here are from Oaxaca—Mixtecos and Zapotecos," explains Paulino Morelos, who comes from Putla. Like many of the 165,000 indigenous Mexican migrants in California fields, a large proportion don't speak Spanish well. "The foreman humiliates them," he says. "He makes fun of them and says they work like turtles. Even if someone is slow, we're working on piece rate, not by the hour, so you only get paid for the work you do. But he's always pushing them to work faster. Carmela, another foreman, says Oaxacos are no good." "Oaxaco" and "Oaxaquito" are derogatory terms for indigenous people from Oaxaca, which Morelos says he hears a lot. Conflict about the piece rate led to a workers' rebellion. At the beginning of the blueberry picking season in April, the company was paying pickers 95¢ per pound. By mid-May, the price had dropped to 70¢, and then 65¢. Finally, on Monday, May 16, the company announced it was dropping it again, to 60¢. Workers refused to go in to pick and called on the company to change its decision. The farm's owner, the Klein Management Company, produces clamshell boxes of blueberries sold under the Gourmet Trading Company label. Like most large California growers, it does not employ workers directly. Instead, it uses a labor contractor, Rigoberto Solorio. In a dramatic confrontation filmed by workers on their cellphones, Solorio told a crowd at the edge of the field, "What I can say is this, boys. We can not raise the price. We gave the price we could. We're not going to raise it. If you want to stay, stay." He was then interrupted by shouts of "Vamenos! "—"Let's go!" In another crew, Morelos says, "Carmela told us, 'If you don't want to work, get out.' I saw cars leaving the field, so I told her, 'We're leaving too.' One foreman said, 'You can take the people out, but don't come back.' We left anyway." Strikers went to the local UFW office, and the following morning, union organizers met with the workers as they all gathered at the edge of the field. A group then went to the offices of the Agricultural Labor Relations Board, which administers California's farm labor law. They asked for a union representation election within 48 hours, which the law provides during strikes. Board agents then went to the field and counted the number of strikers, determining that 424 of the company's employees were involved—far more than the required majority. After further discussions, the election was set for the following Saturday. Meanwhile, the workers returned to work. Jessica Ruiz, who led the first group of workers out of the fields, says "We also had a problem because they'd lower the price after we'd started work. We wouldn't even know what the price was when we started, only at the end of the day they'd tell us." While the piece rate cut was the most immediate cause of the strike, workers had other complaints as well. Ruiz says the wage cut would have cost her more than $50 a week, out of an average $700 paycheck. And to get that paycheck, she and her coworkers pick seven days a week. "They didn't even let us take Mothers Day off," she charges. "My son is only 6 months old, and this was my first Mothers Day. They told me, if you don't work Sunday, you can't come to work on Monday." Despite a recent court decision holding that even piece rate workers must be given paid breaks, the first paid break in the Klein fields came on the day of the union election. Ruiz and Morelos both complained about the water provided by the company. Morelos says it tasted like detergent, while to Ruiz, "the water tastes like oil." The strike and union campaign at Klein Management are part of a larger movement among indigenous Mexican farm workers, which is sweeping through the whole Pacific coast. 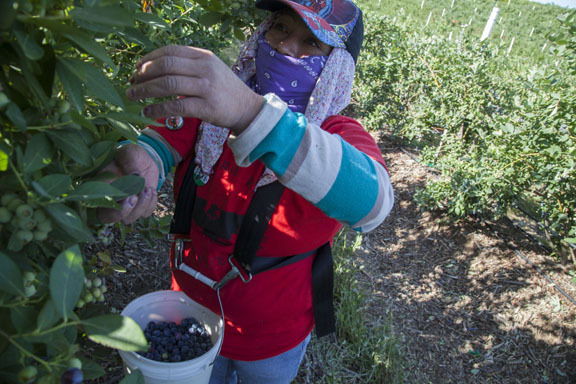 Work stoppages by Triqui and Mixteco blueberry pickers have hit Sakuma Farms in Burlington, Washington, for the past three years. Workers there organized an independent union, Familias Unidas por la Justicia, and launched a boycott of Driscoll's, the world's largest berry distributor. 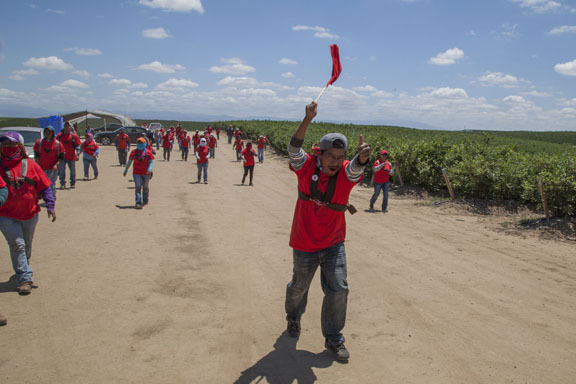 In the San Quintin Valley of Baja California, thousands of blueberry and strawberry pickers walked out for three weeks a year ago, organizing an independent union as well. They joined the boycott of Driscoll's, which also distributes berries from the area's largest grower, BerryMex. The indigenous Mexican workforce along the Pacific Coast comes from several dozen towns in Oaxaca and parts of Puebla, Guerrero, Chiapas and Michoacan. Workers have sisters, brothers, uncles, aunts, parents and children working throughout the coast's agricultural valleys. So many people from Oaxaca have come to California to work that their nickname for the state is Oaxacalifornia. News, therefore, about labor conflict in one area spreads fast to others. When workers in Baja California went on strike, Rosalia Martinez, a pea picker in Greenfield in California's Salinas Valley, says she learned about it on Facebook. "I worked down there for a number of years, picking tomatoes. We agree with what they did. We come from the same towns. We are indigenous people, and we have to do whatever we can to keep our children eating, no matter what they pay. But if we don't work and harvest the crops, there's nothing for the growers either." Workers at Klein Management weren't inspired go on strike by strikes elsewhere, however, but by the brutal economic facts facing indigenous farm workers in California. Of all the state's agricultural laborers, indigenous people, because they're the most recent arrivals, are paid the least. According to the Indigenous Farm Worker Study, carried out by demographer Rick Mines, the median family income in 2008 was $13,750 for an indigenous family and $22,500 for a mestizo (non-indigenous) farm worker family. Neither is a living wage, but the differential reflects structural discrimination against indigenous people. Mines found that a third of the indigenous workers he surveyed earned above the minimum wage, a third reported earning exactly the minimum and a third reported earning below the minimum—an illegal wage. Low wages in turn have a dramatic effect on living conditions. Most indigenous families live crowded in apartments, motel rooms, garages and trailers. In some valleys people live outside in shacks, tents or even under trees or in the fields themselves. Like several UFW organizers helping the McFarland workers, Aquiles Hernandez shares the Oaxacan migrant experience. His family migrated from Santa Maria Tindu, and he worked as a child in the sugar cane fields of Veracruz. Later he became a teacher in Mexico City, and belonged to the leftwing caucus in the Mexican teachers' union, the Coordinadora. "We had a plantón [an Occupy-style encampment] outside the Secretary of Education," he recalls. "Three of us were fired—they took away our classes because we were active in the protests, and I was in prison for 72 days." Concepcion Garcia, a Mixtec immigrant from Coatecas, Oaxaca, was sent in by the UFW when the McFarland strike started. She understood the pressure on the strikers because she experienced the same history. "I worked in Sinaloa when I was a kid, starting when I was nine years old," she remembers. "I've seen a lot of kids in the fields, a lot of need and suffering. So I love teaching our people about their rights. We're not in Mexico now, and we're not living in those times. "I've seen a lot of humiliation and discrimination against indigenous people," she adds. "My whole family works in the fields in Madera, and I've seen a lot of injustice. People get hurt, and go to work anyway. If you have no papers, the foreman threatens to fire you if you don't do as he wants." Garcia has worked at Pacific Triple E, a large tomato grower, for two years. Because there's a union contract at the company, she can take a leave from her job to work on a union campaign. That's also the case with two other organizers sent to McFarland. Edgar Urias is the general secretary of the union committee at the Countryside mushroom shed in Gilroy, which he helped organize in 2001. Juan Mauricio has worked with his wife in Dole Corporation's strawberry fields since 2005. "For the same work I do," he says, "workers here earn much less." Before Saturday's election, UFW vice-president Armando Elenes told the Bakersfield Californian, “If they vote to unionize, we will deal with the issue of wages immediately. Then we’d probably negotiate a contract during the off-season.” A company statement on the first day of the strike predicted that only three weeks of picking were left. The union does have a tool it can use, however, which may make negotiations more fruitful. California has a mandatory mediation law, which says that if the union and management can't agree on a first-time contract, the union can call in a mediator. The mediator weighs the proposals from each side, and then issues a recommendation for an agreement. If the Agricultural Labor Relations Board upholds it, then the mediator's report becomes a union contract. That measure was added to the state's original Agricultural Labor Relations Act in 2002. The Act itself dates from 1975. Mandatory mediation, however, has been challenged by one of California's largest growers, Gerawan Farms, and the case is now before the state's Supreme Court. In the days before the election, Klein management hired a labor consultant and the same well-known anti-union lawyer Tony Raimundo, who was accused of unethical behavior in the Gerawan Farms case. Nevertheless, the Klein statement declared, "The Company prides itself on providing good, high paying jobs every season." Jessica Ruiz responds: "We work in the sun all day, and we work hard. I have no problem with the work, though. My problem is with the things they do to us. I've been waiting for this for a long time. I'm very proud of my people and what we've done. One of the owners said they'd send me to jail when I took the people out. But they're not going to stop us."